Yesterday I asked both the trolls that live with me if they’d be home for dinner. Of course they said and what are we having? I had duck legs defrosting. Both their eyes lit up. So around 5 when they both told me they would be out watching the Leafs in the playoffs I was a little startled but kept my tongue. 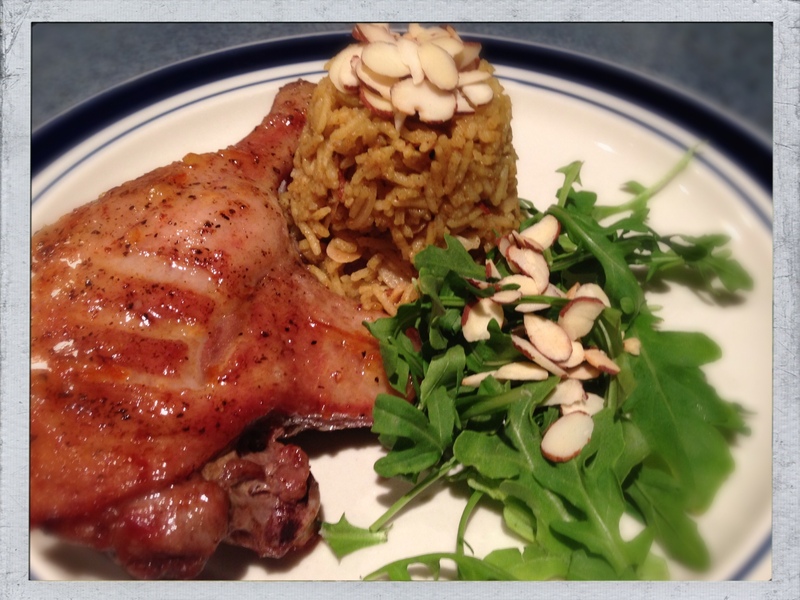 I found myself eating my #duck with curried rice, almonds and grapes alone with a little chardonnay. I kept checking on the Leaf game and #Dancing with the Stars. Different strokes folks. Tonight I have a Vermont Ham and am trying to figure out what to do with it? Off to the grocer for some inspiration! Donald on a plate! Sorry Daisy. This entry was posted in Barbeque, BBQ, Duck, Food, Grill, Home cooks, Smokers, Uncategorized. Bookmark the permalink.